The beehives were required to pollinate her berry crops. This was the beginning of Lucys’ beekeeping career. Her youngest son Bill took over the beehives from her & moved into Central Otago in the early 1930s. The move to Central Otago was made because of the superb clover honey that could be produced on the Maniototo plains around present day Ranfurly. He built his Honey House at a locality called Wedderburn, near Ranfurly and adjacent to the Otago Central Railway (now the Otago Central Rail Trail). 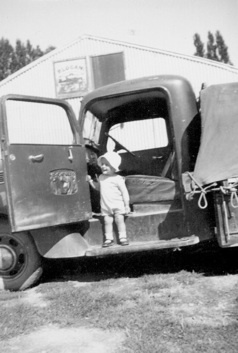 Ernest and the International bee truck, Wedderburn c1941. 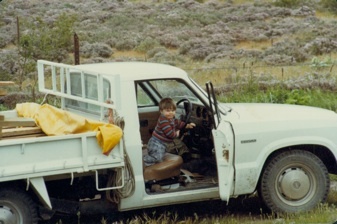 Reece in the mazda bee ute, c1983. Supervising things during the thyme honey flow. 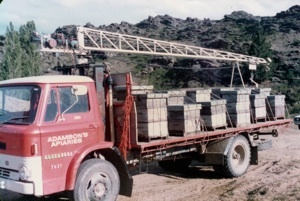 Our old Ford truck with a Kelly hive Loader. Moving beehives onto the thyme. Still going strong! Ernest, Reece & Briar Adamson, Alexandra 2010 with an original beehive of Lucy Adamsons’ from 1906. Wildpure Ltd was established in 2008 by Reece and Louise Adamson on their return from a two year volunteering experience in Tanzania, East Africa. 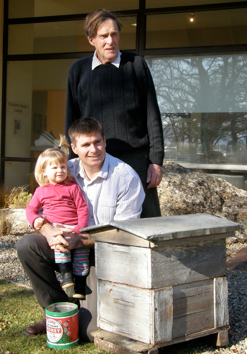 Wildpure purchased beehives from Reeces’ parents, Ethel and Ernest Adamson who have produced honey in Central Otago as Adamsons' Apiary Limited. Adamsons’ Apiary was started in the late 1970s and is still going. Wildpure and Adamsons' work closely together. We own around 550 beehives in the Alexandra Basin, in the heart of Central Otago. Our beehives have been Certified Organic since 1995, but have been managed in the spirit of organic production since the 1900's! We are now 5th generation Beekeepers. Eventually Bill Adamsons two sons Ernest and Walter took over the beehives. They traded as Adamson Bros. The business was eventually divided in two. Ernest moved to Alexandra & built a new honey house. Ernest & Ethels’ operation is called Adamsons Apiary Ltd. Walter still runs Adamsons Honey Ltd, at Wedderburn. He has around 1500 hives which produce clover honey and thyme honey. Wildpure is owned by a family that has been beekeeping for five generations. Our story begins in the late 1860s with Andrew Gibson who was a farmer near Temuka in South Canterbury (NZ). He had emigrated from Ayrshire in Scotland. He is recorded as being an innovative farmer & one of the pioneers of beekeeping in New Zealand. In 1870 he exported over 500lbs of honey. In 1906 Andrew gave some beehives to his nephew and his wife, Adam and Lucy Adamson. Lucy and Adam lived near Hook in South Canterbury, an area that was renowned for blackberry and raspberry growing. Lucy had fruit trees and berries.